Existing systems were used for operational functions. 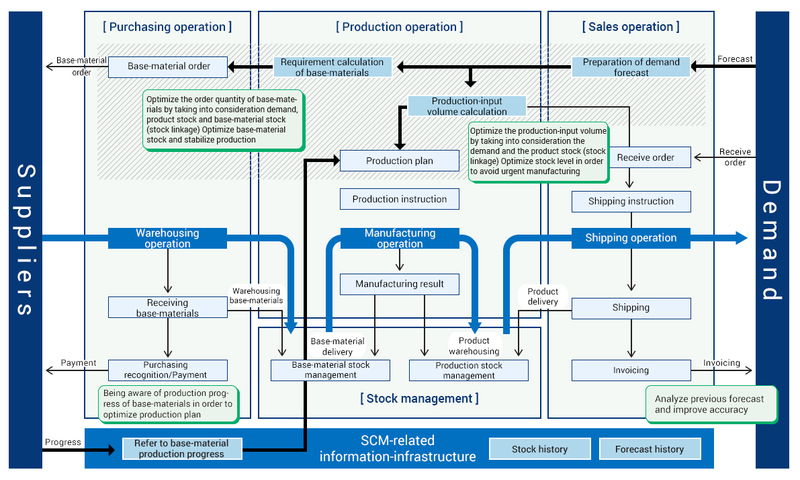 Systematization of management layer was implemented in order to enable optimal stock management and production planning. Set up a system that supports the business cycles including marketing, order-receiving, maintenance, delivery, after service and performance analysis. The new system enables to sharing and central management of business data which used to be managed in each department, thus able to avoid duplicated inputs, to visualize data and to contribute to customer-centric business growth. The new system was established as a private cloud on IaaS infrastructure, enabling the TCO reduction of the system and the accesses from various branches in the country. Non-stop system operation and maintenance service of 24-hour-a-day and 365 days a year based on the best use of know-how on operating of a steel-plant management system in Japan. We will provide services in specialized areas by providing on-site maintenance from Rayong branch and providing technological supports from Bangkok office. On planning state, we will coordinate with Japan side.